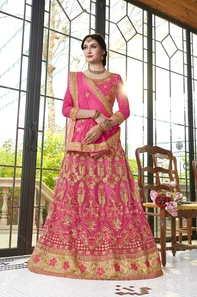 Lehenga Choli is a popular attire for many important functions which require one to be illustrious. With modern metallic embellishments making an entry into the choli designs, choli fashion has gone through a metamorphosis. The fresh designs of gold embellishment is a trending fad observed in the celebrity attires. The different types of choli designs are based on the type of fabric and artwork selected for the choli. Listed below are few types of choli designs and the occasion to match them for. We have provided some of the top most popular Lehenga choli designs. Lehenga stitched in silk gives an elegant and regal look. Crop top or short choli design is a popular choice for choli stitched in silk. It can be simple or grand according to the pattern or style of stitching combined with the embroidery work on the lehenga. Plain silk lehenga's stitched in box pleats, in contrast, goes well with matching jewellery when you are a guest at a wedding. If you want the lehenga to be majestic, brocade silk lehengas are stitched with horizontal tiers of embroidered silk of varying or similar colour. If the tiers and fabric colours are chosen appropriately the style statement for the silk choli is sheer grandeur. You can complement this look by going for a silk brocade top stitched to suit your body type. 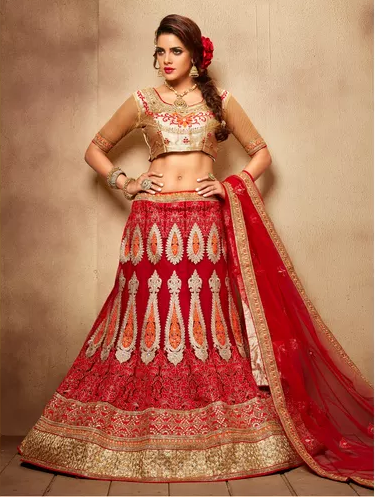 This type of lehenga choli is the latest fad among the celebrities. The fusion designs of the top which stand out in the crowd of brocade tops are designed to complement the lehenga. Peplum style, long sleeves or similar unique designs of the top fuse the western style into the traditional choli wear. Use of silk, sequins and net fabrics for giving different layers for the flared skirt gives an elegant and royal look to this lehenga choli design. This outfit can be stitched to match any formal occasion or a traditional ceremony like a wedding. The grandeur of the design is enhanced with layers of sequin or net patterns on the lehenga. The crop top design is the latest fad observed among the crowd of celebrities. The brocade silk, plain silk, net or velvet is the usual choice for the choli designs. The Lehenga design is given layers by the use of net and sequin or stitched in brocade silk. The crop top lehenga choli designs are best suited for sangeet ceremonies or any party which requires you to be elegant without being loud. Also, choosing light jewellery for the crop top compliments your style statement. The three-piece designs for Lehenga choli are a result of the fusion of western and traditional styles. The two-piece top will usually have a short choli design or crop top design matched with the full-sleeved tunic or jacket design. Velvet, sequin or net fabric are suitable for stitching the two-piece top designs. The lehenga is usually plain in silk. The grandeur to this design is visible in the two-piece top, and prominently in the tunic or jacket. This design is best when you prefer to be comfortable at the party or ceremony. Go for a short choli design with an embroidered net design for the jacket if you have an hourglass body type. The simple yet elegant look created when the lehenga and choli designs are stitched using the embroidered net in single bold colours can transform you into a diva. This is the latest fad prominently visible in all the Sabyasachi lehengas. Use of fusion top designs gives you a unique look at your ethnic wear parties. Hope you liked the types of Lehenga cholis. Now tell us which is your favorite choli design.